Money for old rope - so why am I exhausted? This leaves us caught in a trap: we feel we would be fools to leave such a great sinecure. And so we struggle on, wondering what is wrong with us that we can’t make the most of this; that after work we don’t spring into life as the artist, writer, dressmaker we know ourselves to be at heart; rather that we slump in front of the TV apparently exhausted after doing next to nothing all day. We grind through the endless days of non-work trying to look busy. We wonder why what should be great, and is the envy of friends slowing burning out in the caring professions, feels so awful, indeed, soul destroying. It seems there is a cost to taking the money without feeling we are really delivering value in return. This interesting book is highly recommended. It’s an easy with read with lots of quotes from those in bulls**t jobs. He goes on to offer an interesting analysis of the rise and proliferation of these jobs since the 1980s and the growing of the bulls**tisation of other, previously unaffected and otherwise meaningful jobs, such as teaching. Thinking of ourselves as rational economic actors the trap we find ourselves in makes no sense, and so we can’t resolve it. However, it makes perfect sense from a positive psychology perspective. From work in this field we know that meaningfulness is important to engagement and wellbeing at work. We also know that the boundaries between work and outside work are highly permeable and how we are in one sphere of life will affect how we are in other spheres of life. In other words the draining effect of a bulls**t job will adversely affect our ability to be energised at other times. 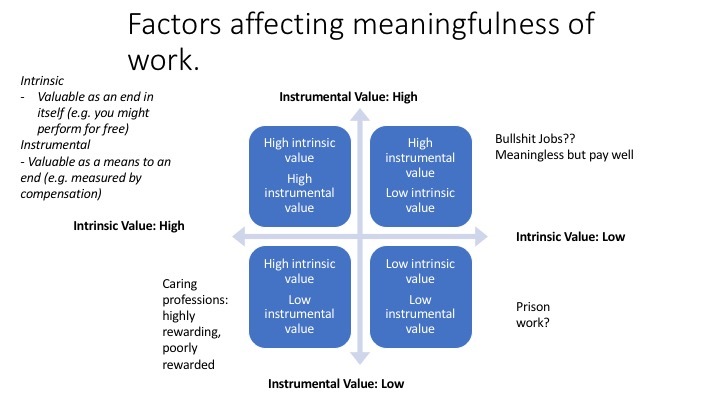 Pondering this, I related David’s theory to a model about the value of work from Christopher Michaelson, who suggests that the value can be arranged across two dimensions. He argues that work can offer a high intrinsic value i.e. feel valuable in itself; it can have an instrumental value, such as being well paid. From these two values we can construct a landscape on which to place different jobs. As you can see below I have had a go at locating where bulls**t jobs fit on this model e.g. high in instrumental value (well paid), low in intrinsic value (pointless). It appears they are located directly opposite to many caring jobs e.g. looking after the sick or vulnerable. Michaelson, C. (2013) The value(s) of work. In Froh, J. J., & Parks, A. C. (2013). Activities for teaching positive psychology: A guide for instructors. American Psychological Association.